This painting by Norman Rockwell, Santa On Train, appeared on the cover of The Saturday Evening Post published December 28, 1940. This remains a timeless favorite of all Rockwell collectors, no matter what their age. Alternate titles for this painting are Off Duty Santa and See Him at Drysdales. This Norman Rockwell Santa Claus painting was the 198th overall of 322 total published Norman Rockwell Saturday Evening Post covers. Rockwell's career with the Post spanned 47 years, from his first cover illustration, Boy With Baby Carriage in 1916 to his last, Portrait of John F. Kennedy, in 1963. This was also the seventh Rockwell Post cover of 1940. The original oil on canvas painting, 38 x 30 inches or 96.5 x 76 cm, is housed in a private collection. And to think it only cost five cents! It sells for way more than that today. Norman Rockwell, A Definitive Catalogue by Laurie Norton Moffatt on page 146. Even Santa needs a break sometimes. This painting answers the question in every child's mind. Does he drive the sleigh everywhere he goes. Well, the answer is apparently "no." In this painting, Santa is riding home on the train. He looks to be dozing and is unaware of the surprised boy peeking around the corner. The boy has every reason to be surprised. Santa does not look the same as last time. Actually, this Santa may not have been exactly the fellow that the boy saw earlier in the day. But he wears the same suit. You see, the sign next to the dozing off-duty Santa says "See Him at Drysdale's." The little boy's two packages have the Drysdale's logo on the wrappers. So the boy has seen Santa earlier in the day. I'm sure he was not expecting to see a beardless Santa Claus on his train ride home. I wonder how the boy's parents explained this sighting to him. My parents always told me that the real Santa did not work in stores, appear in parades or show himself at all before Christmas Eve. And he was extremely hard to see then! 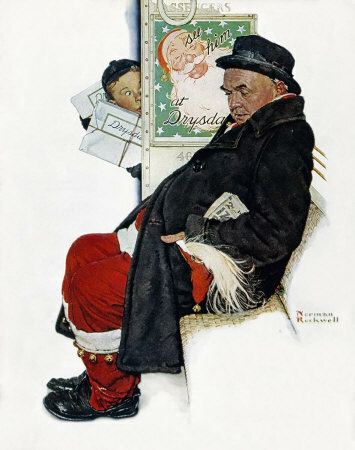 Santa On Train was only one of 322 Norman Rockwell Saturday Evening Post covers; Here is the list of Norman Rockwell Saturday Evening Post cover illustrations. As for why Santa is on the train? Well, apparently, today is the reindeer's day off. At least, there is still some uncertainty left with this painting, unlike with The Discovery. Do You Have A Great Story, Opinion Or Contribution About Santa On Train?